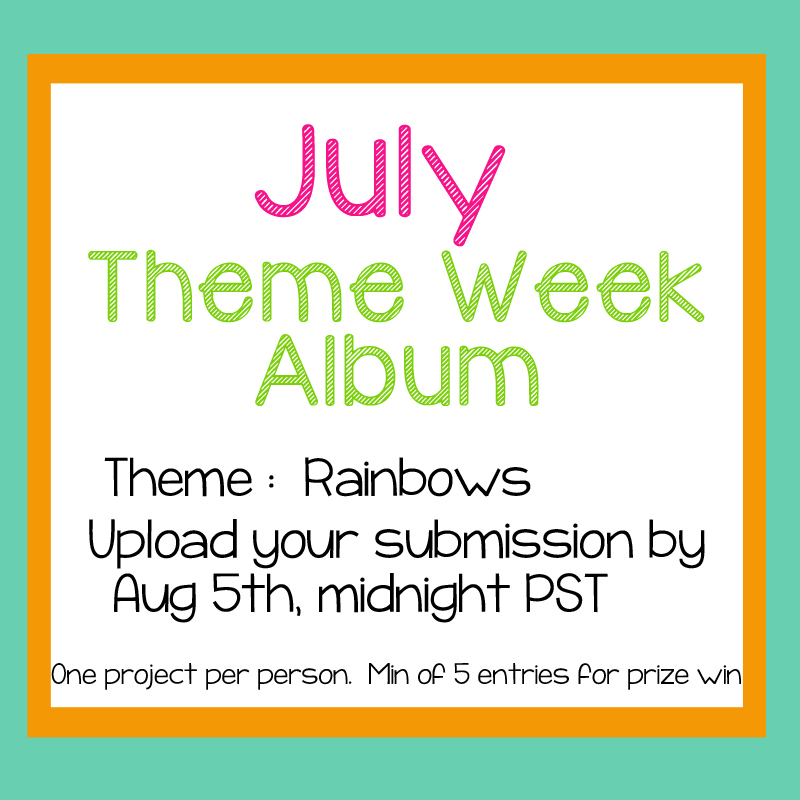 So here we go for July'sTheme Week! 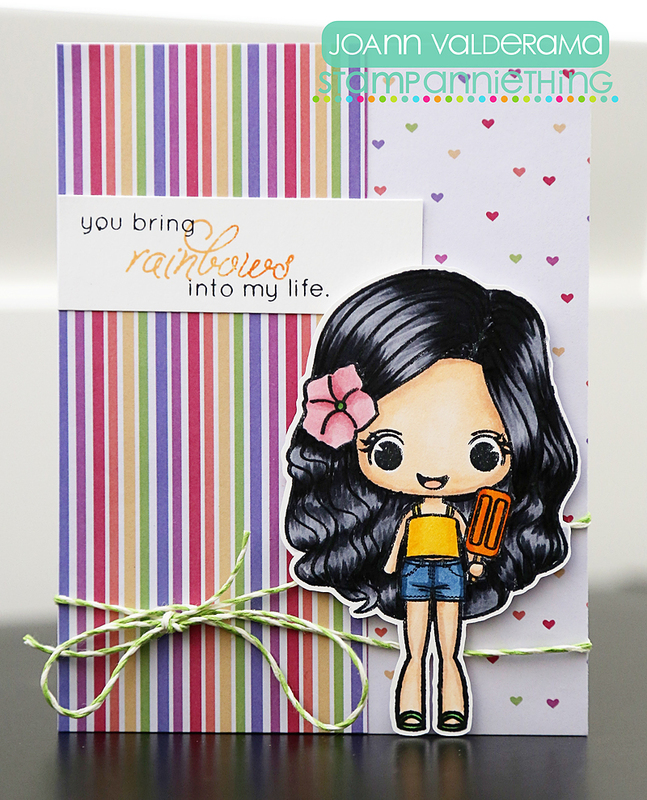 Katya Bess here from KattyXotica's Kreations and I'm here to show you my rainbow card. 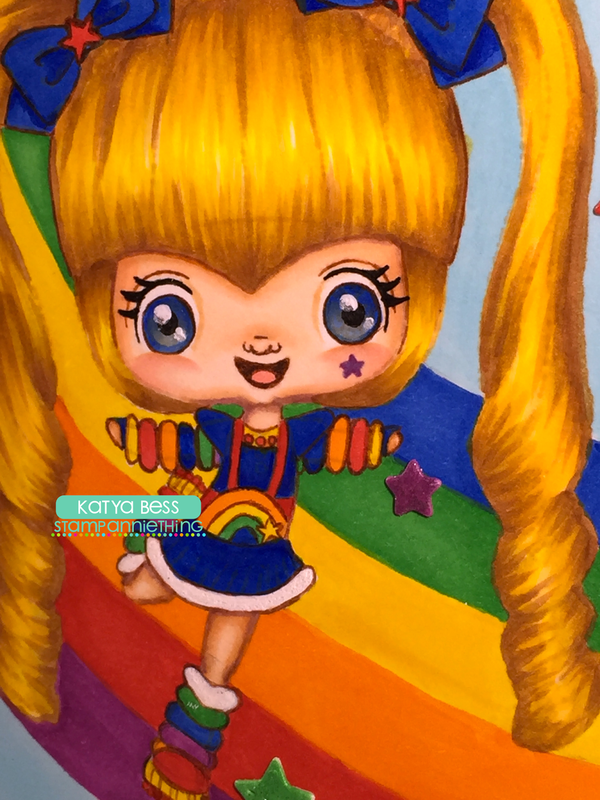 have any of Rainbow Brite dolls or toys? The Color Kids or maybe even a Sprite? when trying to soothe her and distract her from her severe Eczema itching. closely you can sort of see the original lines. This is how Trudy - Happy Day! looks before the no-lines-coloring technique. the colors look a little brighter in person the blues in her clothing look a little too dark here. Here you can see here up close. Here you can see the shimmer on the stars. My Creative Time dies as well as the rectangle to cut out the layer. rainbows are one of my favorite things to see and color. 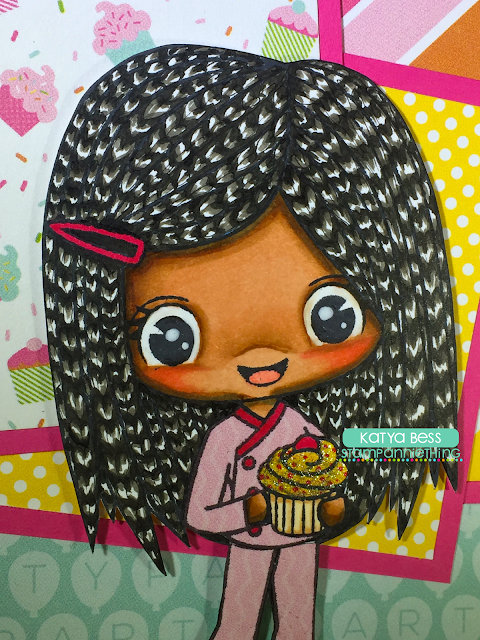 Labels: copic markers , copics , Katya , Monthly Theme Week Challenge , no lines coloring , theme week , Trudy , Trudy - Happy Day! 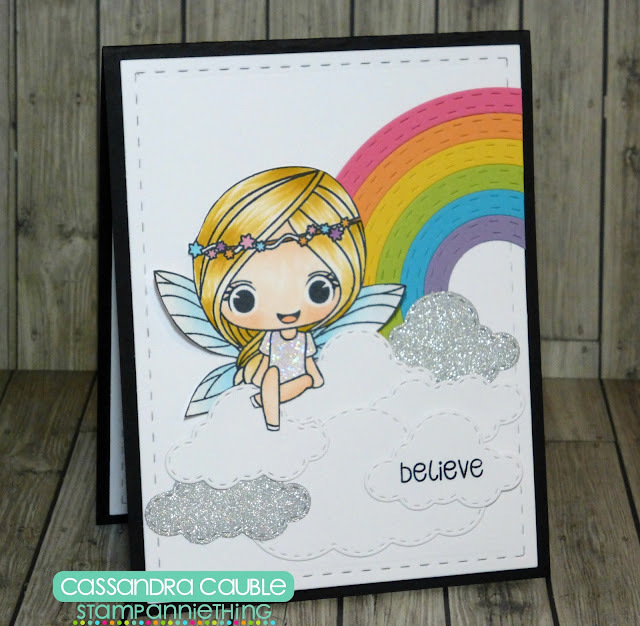 Melissa from Doxie Mel Designs up on the blog with you today. 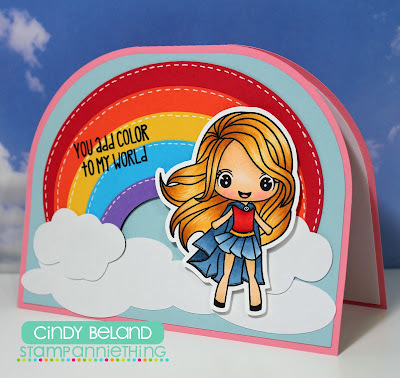 I picked out some "rainbow" pattern paper for the background. The image is Megan and she is colored with Copic Markers. Dies used to create the card are from Jaded Blossom. I added a photo corner that was cut on my Silhouette. Time for a smile. 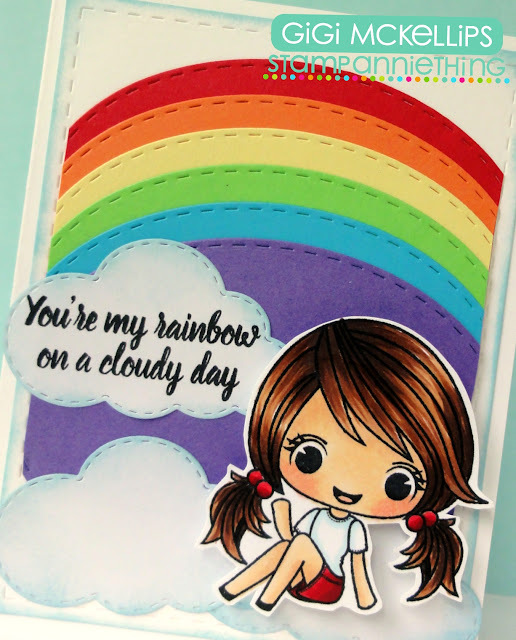 It's all about RAINBOWS! Simply use rainbow colors and themes. 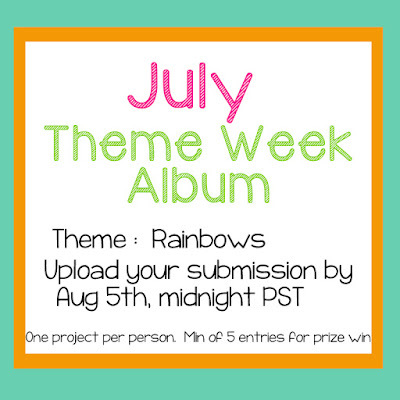 Make ANY project using rainbows (papers, colors, patterns, etc)!!! 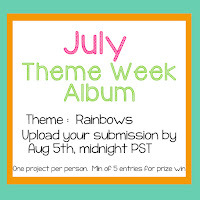 All projects must be uploaded by midnight PST August 5th to qualify. Again, a minimum of FIVE entries for a prize win! This is the sweet little Stamp Anniething ~ Kelsey : Believe. I colored her in with Copic Sketch Markers. I cut the background piece using the Jaded Blossom ~ Card Mat Dies. To make the rainbow, I used the Jaded Blossom ~ Stitched Circle Dies. On the bottom I used the Jaded Blossom ~ Spring Dies 2 for the clouds. 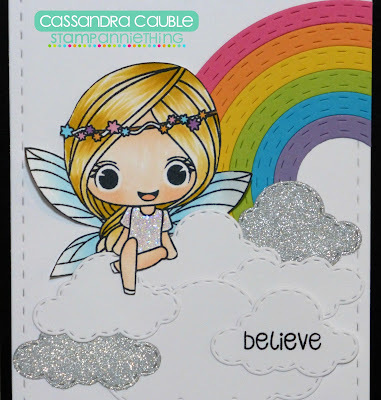 The "believe" sentiment come with the beautiful Kelsey stamp. Well my creative friends, that's it for me today. I hope you join in the Challenge this month. I can't wait to see what you all make. Have a great day everyone! 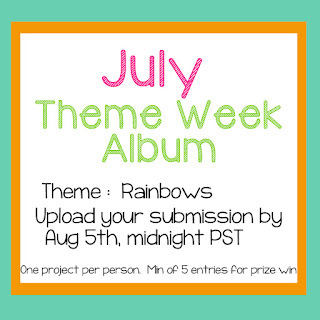 July Theme Week Day #3! 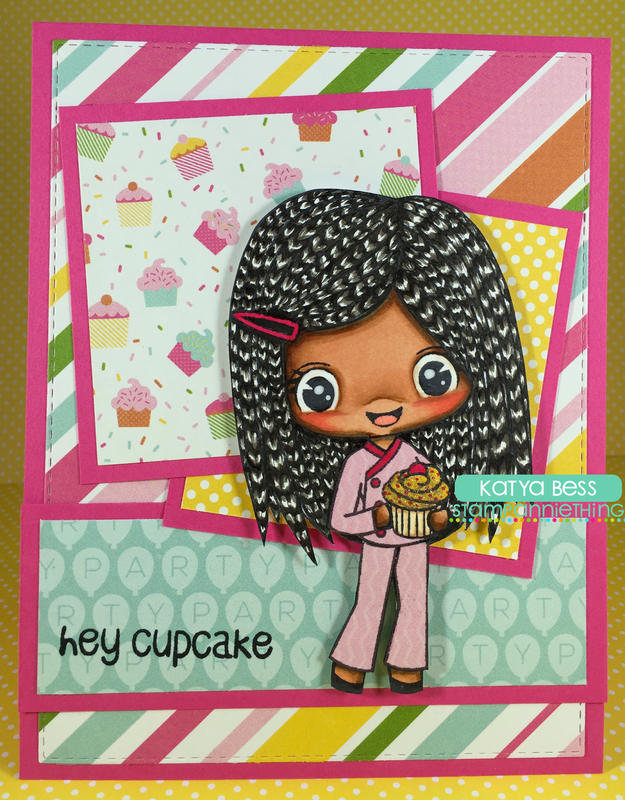 I used the Kelly-Happy stamp set for my Theme Week have card. I created the rainbow but cutting each color using the Stitched Oval Dies and then layered them all together, trimming off the sides so it was straight. 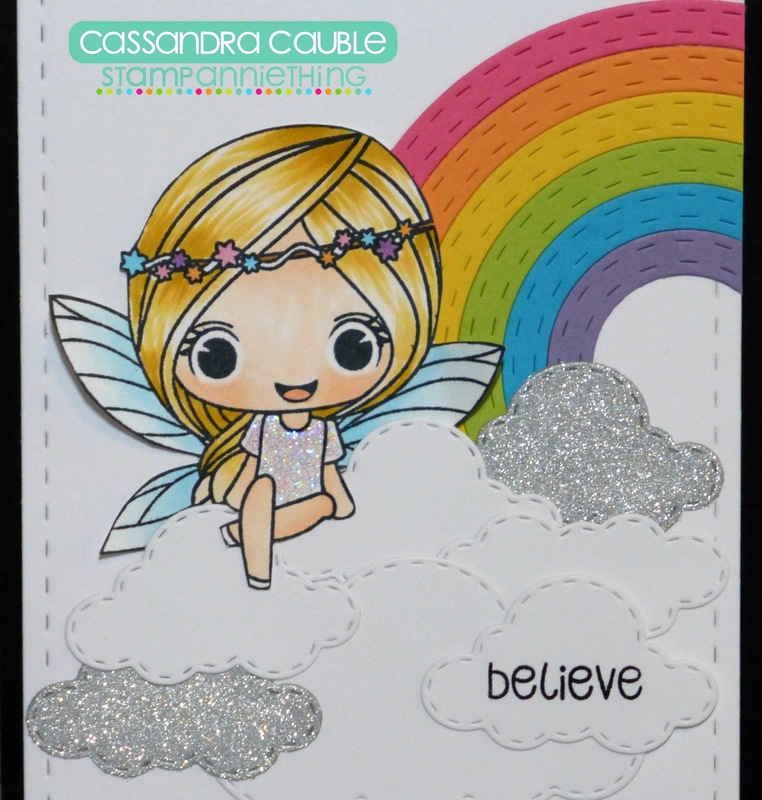 I added the clouds cut with the Spring Dies 2 and stamped the sentiment with the Unicorns and Glitter stamp set. 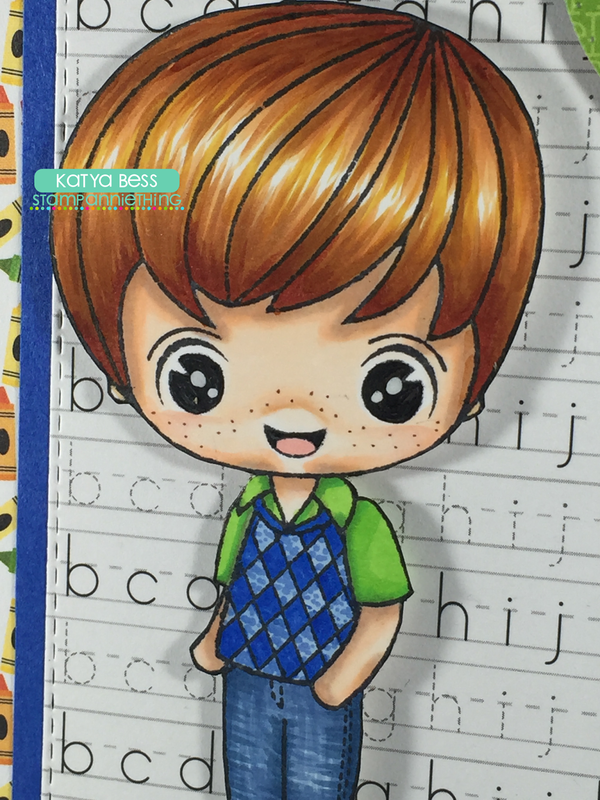 To finish, I stamped and colored Kelly with Copic markers and pop dotted her to the front of the card. Here is what I made for today! the rainbow and from Jaded Blossom I used Sweet Travels for the sentiment. 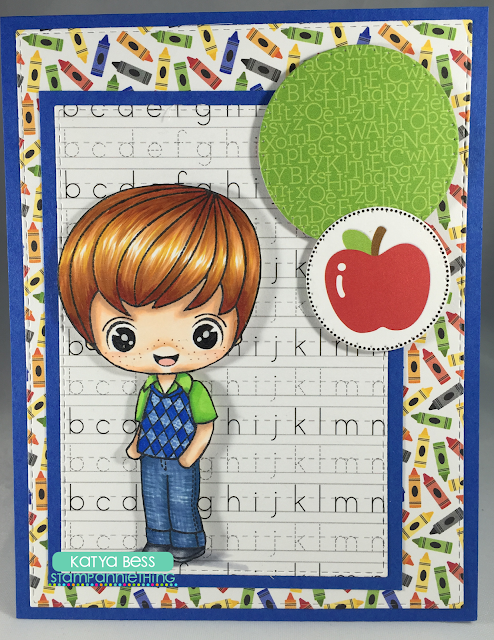 Katya Bess, today I am showing you a card with sort of a school theme. I used the fun papers from Doodlebug Design called: Back to School. The stamp I used is James - Happy Birthday to You. This stamp comes with a sentiment but I did not use it this time. and the card sketch is very simple to recreate. Hello! 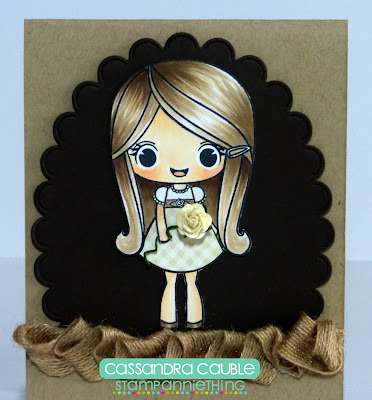 Melissa from Doxie Mel Designs here on the blog. To make this card I combined two stamp sets, Brittney - Purr and One Cool Cat. 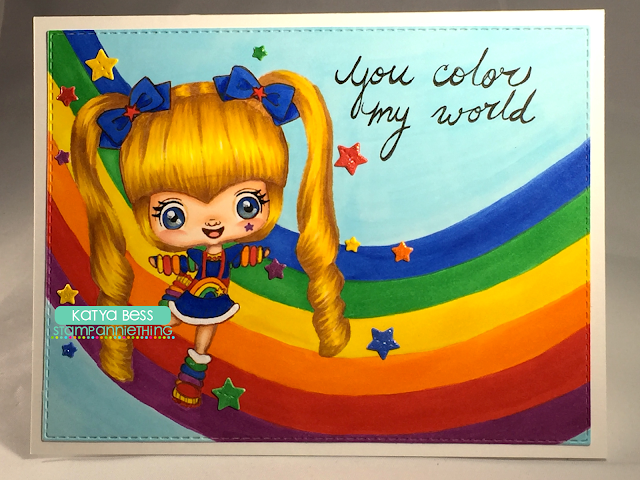 Brittney is colored with copic markers. 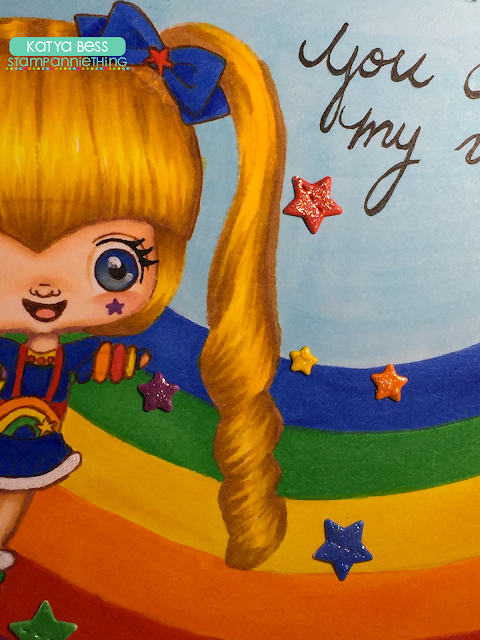 You can check out the video below and see how I colored her and assembled the card. The dies are new to my stash and are from Jaded Blossom, Rectangle Dies 1 (large) and Rectangle Dies 2 (inner panel). I am obsessed with rectangle dies, lol. Hello everyone! This is Cassandra from Creating with Color by Cassandra. And today I have a sweet "Thinking of You" card to share. 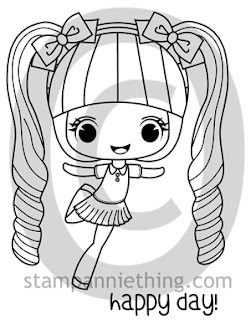 This is the sweet little Stamp Anniething ~ Melanie : You're Sassy. I colored her in with Copic Sketch Markers. 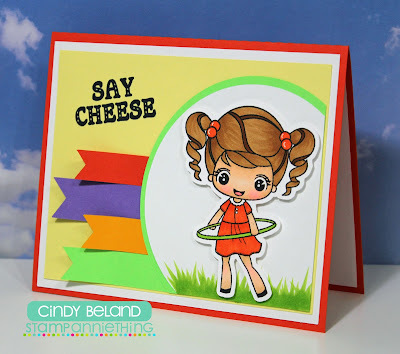 I cut the background with the Jaded Blossom ~ Scallop Oval Dies. The sentiment at the bottom is from the Jaded Blossom ~ Hey Chickie. And the hearts are from the Jaded Blossom ~ Valentine Treat Tag. 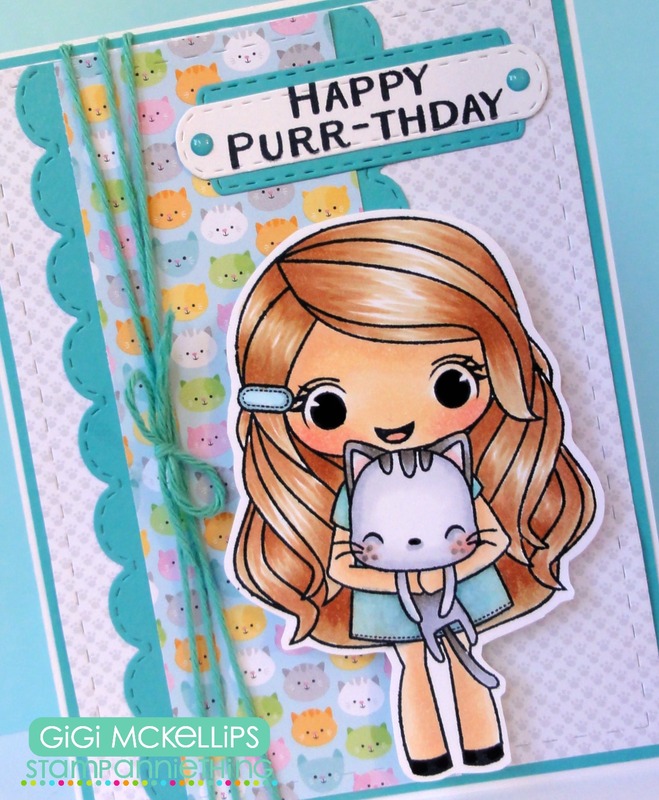 I used the Brittney-Purr stamp set for my card. 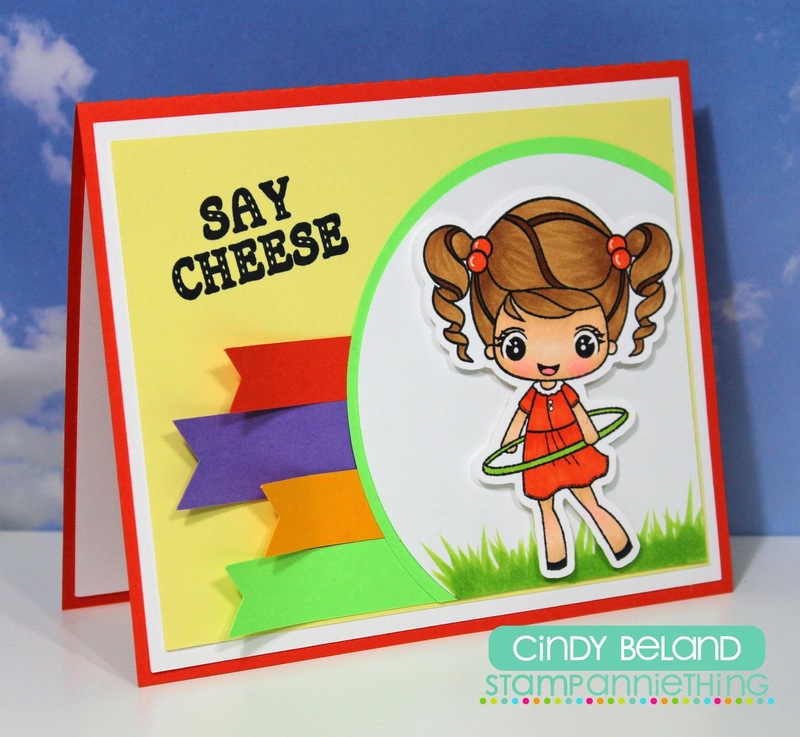 I created the center strip by cutting a strip of decorative paper and then added edges cut with the Border Dies to the sides, tying a piece of twine around it. To finish, I stamped the sentiment from the Party Animal stamp set onto tags I cut with the Mini Tag Dies 2. Card Sketch 26 for my card base. Thank you for stopping by and have a GREAT Day!!!! Prismacolor pencils and you can see my process here. but I also tried a slightly different technique that was a little faster too. Hello! 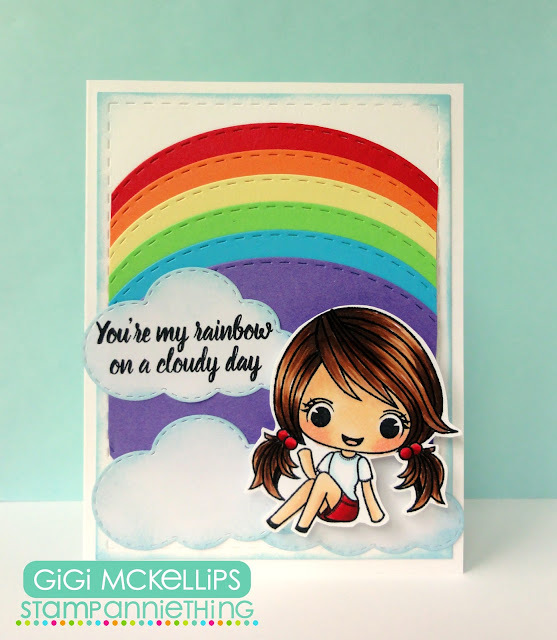 Melissa from Doxie Mel Designs with a new card for you today. This sweet girl with her cotton candy... so adorable. She is colored with Copic Markers. I stamped her on a smaller stitched circle die with a fame to focus your eye. You can find her on the Fun Starts Here stamp set. The sentiment is from Jaded Blossom's Super Sized Birthday Greetings. July Release Day # 3 Abigail, You're Fun!